I think Target is my new go to place for Halloween candy – have you seen their section yet? Oh my goodness, there are aisles upon aisles of Halloween candy. Not good, but great. If you follow me on Instagram, you should of seen my picture where I uploaded a photo of candy corn coffee. Yes…candy corn coffee! I think I am in heaven, oh yeah. Aren’t these just adorable? How could you possibly eat just one? 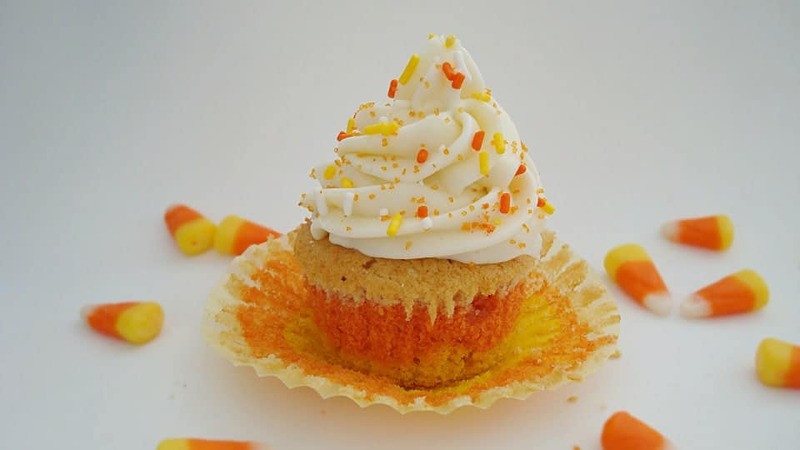 (: Children will absolutely love these cute candy corn cupcakes. In a small bowl, mix together the flour, salt, and baking powder. Set aside. Using an electric or handheld mixer, cream together the butter and sugar for the cupcakes. While the mixer is still going on low, add in the eggs one at a time. Slowly add in the dry ingredients into the wet ingredients. Take the cupcake batter and divide it into three bowls with equal amounts of batter. Add orange food coloring (red and yellow makes orange) into one bowl of batter. Add yellow food coloring into another bowl of batter. Leave one bowl of batter white. Pour each color into the liners and make sure to only fill 3/4 up. To prepare the frosting, cream together the butter and cream cheese. Slowly add in powdered sugar 1/2 cup at a time. What is your favorite thing to add candy corn to? I love these cupcakes! 🙂 How fun! Too too too cute!! Pinned! Thanks for sharing at Marvelous Mondays ! Chelsea, These cupcakes are so cute and I love how the stripe shows through on the cupcake liner. At first, I thought they were candy corn liners. Great photos too! Chelsea, these are ADORABLE! I’m so glad you were able to find candy corn to make these gems. They look like Halloween in cupcake form! Cupcake looks perfect . Creamcheese frosting is perfect . I never get the creamcheese frosting stiff like the one in your pic. Bookmarking it .. Glad i visited your blog. happy to follow you.. Thank you Shey and thank you for stopping by! I will definitely check out your Lets Celebrate Halloween! Very pretty! I included it in my Candy Corn Whimsy Wednesday Features today! These look really good and super easy to make. I know my kids would have fun baking these cupcakes. This is delicious looking! 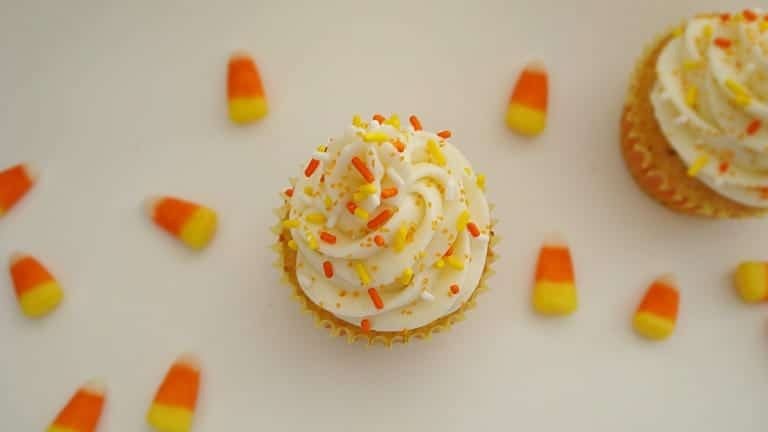 I love candy corn and cupcakes, put them together and it is certainly a WIN! lol. Plus the pictures make them look so beautiful! Can’t wait to make them for my sons class! i can smell ’em already! They look so tasty. Thanks for sharing. I must try these! These look amazing, and they are on the to-bake list! I know this sounds kind of sad, but I do my best to make seasonal/holiday treats for my kids while they’re young enough to appreciate and enjoy them. 😉 When they’re older I know they won’t give a damn about seasonal colors and such, but for right now I’m taking advantage of the ability to “wow” them. And since they both love candy corn, these cupcakes should be a hit! These are super cute and sound delicious! I hope to try and make them! These look really easy and super cute. I will have to try them with my nieces. Gotta try the candy corn cup cakes theyr look so yummy!! I love candy corn and this I LOVE! I would love to use this for Halloween! I’m sure my son’s class at school would love them too! These look amazing, and tasty! I love that they actually LOOK like candy corn, which is one of my favorite Halloween candies! Thanks for the recipe! We are having a Halloween party for the kids I am so going to make these,thank for sharing. Thank you so much for stopping by and featuring me! I have to try this! 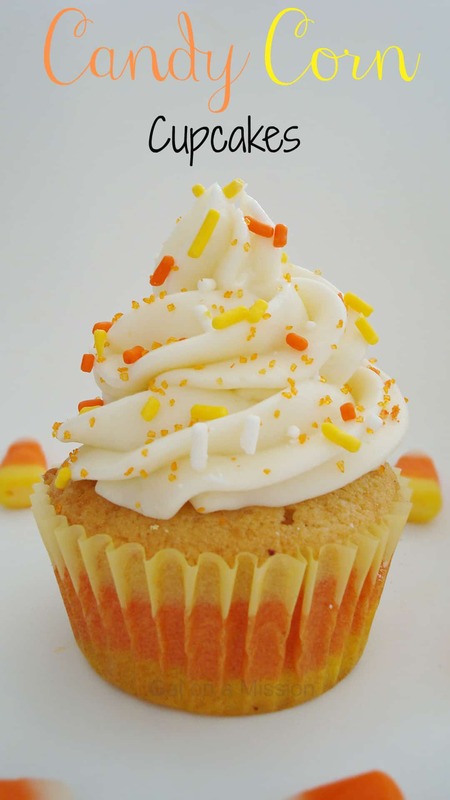 I absolutely love candy corn and cupcakes…putting them together has to be amazing! I am going to make these cupcakes tonight!! yummy! Those look and sound delicious. Candy corn coffee? Is it a creamer or do you actually melt the candy in? I’m curious. Thanks! Yep, candy corn coffee. I have only seen it in Target. It is just coffee that tastes like candy corn. Probably artificial flavoring. Candy corn is my absolute favorite thing about Halloween! I can’t wait to try these out! I’ve never seen anything like this! They are adorable, and sound very tasty. I”m pinning this now!